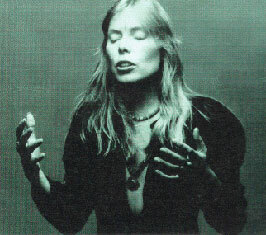 Joni recorded several songs on August 17, 1966 for use on the TV Series Mon Pays, Mes Chansons, w/ David Rea on 2nd guitar. Chansons was a series of 13 musical programs highlighting Canadian folk songs old and new, filmed in color against some of Canada's most attractive scenery coast to coast. The series was originally telecast on SRC in the summer of 1966 and on the English language CBC network during the 1966-67 season as a musical salute to the Canadian Centennial of Confederation. Each program originated from a different place, and featured musical numbers appropriate to the scenic location in which they were set. The two programs featuring Joni were broadcast on Nov. 10, 1966 & Feb. 9, 1967.
well even the cattle seemed to be going in Circles!